Call it the Tata effect. 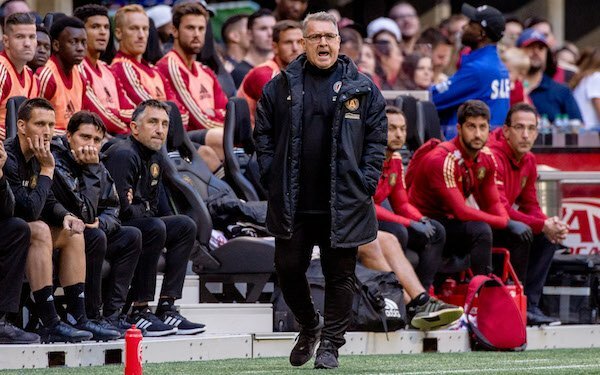 MLS coaching ranks are changing, and it has a lot to do with the success of Gerardo Martino, who led Atlanta United to an MLS title in its second season. LA Galaxy. Sigi Schmid --> Dominic Kinnear (interim) --> Guillermo Barros Schelotto. San Jose. Mikael Stahre --> Steve Ralston (interim) --> Matias Almeyda. Vancouver. Carl Robinson --> Craig Dalrymple (interim) --> Marc dos Santos. FC Dallas. Oscar Pareja --> Luchi Gonzalez. Columbus. Gregg Berhalter --> ? Atlanta United. Gerardo Martino --> Frank de Boer. The LA Galaxy's hiring of fellow Argentine Guillermo Barros Schelotto on Wednesday was the third major hire of a foreign coach by an MLS club for the 2019 season. Barros Schelotto (back-to-back Argentine titles with Boca Juniors after winning the Copa Sudamericana) follows fellow Argentine Matias Almeyda (five titles, including the 2018 Concacaf Champions League, with Mexico's Guadalajara, plus Argentine Primera B Nacional titles with River Plate and Banfield) at San Jose and Dutchman Frank de Boer (four consecutive Dutch Eredivisie titles with Ajax) at Atlanta United, where he replaces Martino. With the exception of Carlos Queiroz and Carlos Alberto Parreira in the first two years of the MetroStars, no coaches have arrived on the scene with the credentials that Martino had when he was hired for Atlanta United's launch in 2017 or that Barros Schelotto, Almeyda and de Boer have. Martino's success has spurred teams to look abroad for -- and pay -- coaches with a record of success, and his endorsement of Atlanta United -- and by definition MLS -- has legitimized the league in foreign coaching circles. After winning MLS Cup 2018, the Argentine was asked to compare the Atlanta United job to others he has in his career. He was reluctant to do so other than to say he was presented a plan when he met with management in September 2016 in Rosario and it never deviated from that plan. "They gave the coaching staff absolutely everything you need to be successful," he said, "and that is what makes it the most satisfying.” Implicit in what he said is that he didn't always in the past get the resources he needed or there was meddling by management or ownership. Tata Martino is very much the exception to the rule, though. To begin with, no coach has ever been given the player budget he got from Atlanta owner Arthur Blank. And few coaching imports have succeeded in MLS. Martino was the first foreign coach without any previous coaching or front-office experience in the USA and Canada to reach MLS Cup, let alone win it. Of the 23 foreign coaches who fit into that category, just five have winning records and three have coached more than two seasons in MLS. If Veljko Paunovic returns, as expected, at Chicago in 2019, he will be the first such coach to work into his fourth season. Indeed, MLS has a long history of foreign coaches who have come into the league and been busts. The most recent was Swede Mikael Stahre, who lasted only 28 games before being fired by San Jose in 2018. Note: Coaches with no previous coaching or front-office experience in USA or Canada. 14 comments about "Foreign coaching hires follow in Tata's footsteps". Ric Fonseca, January 3, 2019 at 11:07 a.m.
Well, indeed in my and other's humble opinion, the hiring of "foreign trained" coaches doesn't bode well for US Soccer trained-experienced coaches. It's the same old same old, that if you want a job coaching in MLS or lesses leagues, no experience, then sorry bud. So how is one to get/gain experience if not given a chance? Is it any wonder that not many US-born/trained/experienced coaches don't even want to give the MLS/others their applications, simply and because the abover article tells it like it is? This does boggle the mind!!! Bob Ashpole replied, January 3, 2019 at 5:07 p.m.
Ric, I wouldn't mind successful foreign head coaches being hired if most of the assistants were US coaches. In the long term that should work to our advantage. Having assistants familiar with the league should also help foreign coaches learn what they need to know about MLS. But that is still a big "if" because most coaches depend heavily on trusted assistants and bring them when they change clubs. frank schoon replied, January 4, 2019 at 9:34 a.m.
Bob, Exactly and I wish the USSF could have a program ,for example to be able to place an American coach to be assistant to Guardiola's coaching staff or other great coach...Can you imagine sending Hugo Perez, or Tab over there. If American coaches want to learn what real soccer is about then be with the best first. R2 Dad, January 3, 2019 at 11:32 a.m.
Wha? I thought there were dozens of top NCAA coaches that would fill the bill in MLS. No? Imagine that. Ric Fonseca replied, January 3, 2019 at 12:28 p.m.
R2D2: I concur with your comment!!! I suppose that since the Euro/Brit trained coach/manager has (hopefully) been exhausted, that the MLS Gurus will now turn to the New World, formerly known (15th Century terminology) as LA TERRA INCOGNITA, i.e. South America/Argentina in order to assuage the concern that they (MLS) are not wont to get/sign local US born/trained talent of Latin American descent.... ever wonder about this? Lastly, why then, would US Soccer and the old NSCAA coaching schools made the effort to produce more and more "US coaches/managers?" R2 Dad replied, January 3, 2019 at 1:55 p.m. I know, right? The Tata/Argentina connection has been great for the league. I hope MLS continues to mine ALL the top clubs in SA, not just the Argentinian ones (though I see SJ Quakes already found their own ARG manager in Almeyda) And not just for the head coaching positions, but for their USL and academies, too. Bob Ashpole replied, January 3, 2019 at 5:13 p.m.
Actually I imagine there are many successful college coaches that "would fill the bill in MLS". Why would an established successful college coach leave and take a job in MLS when even the best coaches in world rarely last more than 2 or 3 seasons at a professional club. frank schoon replied, January 4, 2019 at 9:35 a.m.
Bob Ashpole replied, January 4, 2019 at 4:32 p.m.
Frank, the problem is that the typical soccer in Europe is also BS compared to the top European clubs. Even clubs in the bottom half of the top 5 leagues don't compare to clubs in the top half of the top 5 leagues. MLS is based on parity, so the better basis for comparison would be with middle of the table teams. The better comparison would be to compare MLS to second division teams such as in the Championship in England. I don't have a clue as to how they compare. I only followed one Championship team briefly years ago, because I was interested in how the Manager ran the team. It would be an interesting subject, but I have never seen anyone discuss it that actually looked into it. frank schoon replied, January 4, 2019 at 5:43 p.m.
Ric Fonseca replied, January 5, 2019 at 6:12 p.m.
> R2Dad, o ye of little faith! I do like Bob and Frank's comments, though I would call it something like a "coaching apprenticeship" with pay. So, if someone in MLS/US Soccer could tell us just how many coaches it has licensed (C, B, A level) since they first brough over Dettmar Cramer - at least they did in 1971-72 when the coaching license dog and pony show was introduced during the summer of those years? I do believe that they should, by now, have some idea, locked away or shelved somewhere in the "Soccer Attic Library," in Chicago's US Soccer House!!! So they sure as tootin's cannot deny not knowing, and thus maybe the MLS brain thrusts can and ought to troll the US-trained coaching ranks, that would and eventually benefit futbol-soccer USA style! Ric Fonseca, January 3, 2019 at 3:51 p.m.
Why then are "we" LOATHE to develop our own players, managers/coaches, etc??? It seems to me that importing coaches/managers is more costly, and the "USL and academies," right? R2 Dad replied, January 5, 2019 at 10:07 p.m.
Ric, it's not that we don't want to develop our own players and managers--it's more that we don't know how. That's why Martino, coming in with a clean sheet and an idea of how he wanted to play (and more importantly, the players that could execute that vision), was able to build a winner within 2 years. Every coach has ideas--but do they know their country's player pool well enough to envision the right person at the right position to implement those ideas? Martino didn't have to overcome an existing culture, dressing room dynamic--any other hurdles of an existing team. I don't think we should discount that, either. Craig Cummings, January 3, 2019 at 10 p.m.
We can look at a coach like dean warztbeger, sorry wrong spelling as an assistant on us nat team. He did a great job at U washington for many years and before that san fransico blackhawks i believe was thier name, i could be wrong with the name. and before that was my coach at La Quinta H S in westminster ca. I later after college coached in deans ways at L Q for8 years A great great coach. USA needs more coaches like him. I heard he moved to texas. Not sure what he does now.